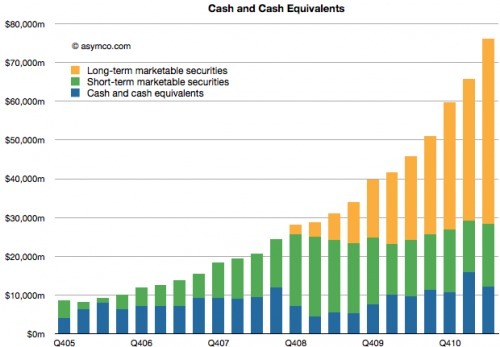 Apple's cash and marketable securities increased to $76,156,000,000 last quarter, reports Horace Dediu of Asymco. Dediu notes that the amount is now nearly 16% higher than three months ago, and that the amount added last quarter is higher than the amount on hand 4.5 years ago, and that the cash added is higher than Google's overall revenues in the quarter. The composition and growth of Apple's liquid assets is shown in chart below. You can learn more about Dediu's thoughts on this chart in his last Critical Path show.